Lock picking is the name given to the process of opening a lock without the correct key. This activity forms a major part of the day-to-day work of any locksmith, and often requires a great deal of skill, knowledge, and most of all patience. This article will explain the basic idea behind picking a lock, to give you an insight into the process a locksmith goes through when called out to help somebody who is locked out of their home. Successful lock-picking relies on being able to exploit defects in the mechanical structure of the lock. Different locks have different weaknesses and characteristics, but generally most locks used by households and commercial properties are vulnerable in one way or another. Through studying and practice, professional locksmiths know the traits of each type of lock and are thus able to identify which technique to use in order to exploit this. Many of the most common locks are of the pin and cylinder variety. These have a set of pins which slot down into a cylinder when locked, holding it in place and preventing the lock being opened. When you insert the correct key into the lock, it forces up the pins, freeing the cylinder and allowing you to turn it, thereby opening the lock. To open this kind of lock without the correct key, a locksmith must first insert a tool to determine which direction the cylinder needs to be turned. Once the locksmith has identified the right direction and turned the cylinder, they will then insert a pick or similar tool into the top part of the keyhole and begin coaxing the pins up out of the cylinder. 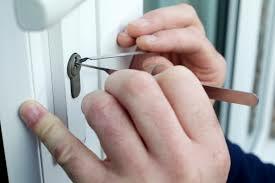 The locksmith should then be able to turn the cylinder fully, which will completely unlock the lock. It goes without saying that the process requires a huge amount of concentration. A locksmith will not always be able to see what they are doing when picking inside a lock, so they have to rely on their ability to touch and feel their way around the mechanism. One reason that many people get into locksmithing is that they find they love the challenge of picking a complex and demanding lock. In much the same way that word puzzle enthusiasts enjoy doing difficult crosswords, the fun is in testing your mind and feeling a sense of achievement when you overcome your challenge. Professional locksmiths are trained in the use of non-destructive entry methods, which means they will always try whenever possible to open your lock without causing unnecessary damage to the lock or the door. This will potentially prevent you having to spend money on costly repairs on top of the cost of the locksmith callout itself. Many people who have not tried lock picking underestimate just how difficult it is to master. Having seen it only on television and in films, they assume that the tools do all the work in opening the lock, but this is really not the case. Only an individual with strong analytical skills, a focused mind and a good background of experience and knowledge will be able to pick a household lock quickly and with a minimum of damage and fuss. This is why professional locksmiths continue to play such an important role in our society, as there are always people out there in demand of their special set of skills and know-how.